Detergent « Global Market Insights, Inc. Rising awareness regarding the ill-effects of phosphate based detergents has led to a massive growth in Zeolite 4A Market, subject to the fact that this product is environment friendly and possesses excellent ion exchange capacity. Its heat capacity ranges between 37 Kelvin to 311 Kelvin, owing to which it is characterized by strong enthalpy and thermodynamic stability. These benefits lead to zeolites finding applications across the detergent and catalysts sectors. The product has high sequestering power even at elevated temperatures and refrains from depicting fertilization effects, owing to which zeolite 4A industry encompasses an application landscape comprising waste water treatment, packaging, petroleum refining, gas separation, and air separation & drying. The presence of excess phosphorous content in water can hamper the growth of aquatic plants, leading to ecological imbalance. In addition, the presence of hazardous phosphates in wastewater can also lead to environmental pollution. These issues demand the elimination of phosphate, which is posing to be a serious threat to quality drinking water and the environment, and have generated a requirement for zeolite-based adsorbents, which will impel zeolite 4A market growth. Regulatory norms pertaining to environmental pollution and the hazardous effects of phosphate will spur zeolite 4A industry size, slated to surpass USD 2 billion by 2024, growing at a CAGR of 5% over 2016-2024, having had a valuation of USD 1.2 billion in 2015. Global liquid detergents demand was more than 5.4 million tons in 2015 in terms of volume and is likely to exceed 7.6 million tons by 2024, with an estimated CAGR of more than 3.2% over the next few years. Global powdered detergents market on the other hand, was worth more than 12.6 million tons in 2015 and is stipulated to exceed 15.2 million tons by 2024, with a CAGR of 2.3% over the next few years. The extensive growth of the aforementioned sectors will stimulate zeolite 4A market from the detergent industry. Zeolites are highly efficient to remove dirt particles and prevent foreign particle deposition, owing to which they are used as phosphorus replacements to manufacture detergents. This will augment zeolite 4A industry size from detergent applications, slated to generate more than USD 535 million by 2024. 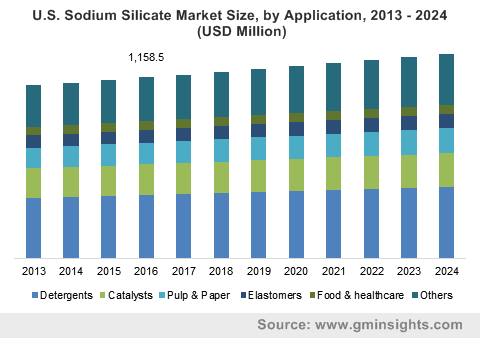 Subject to the presence of numerous detergent and refrigerant manufacturers and a favorable regulatory landscape regarding GHG emissions, Germany zeolite 4A market is expected to register more than 77 kilo tons by 2024 in terms of volume. Netherlands is reputed to be one of the first five countries that set a benchmark for banning phosphate based detergents. Subject to the stringent norms enforced by other regulatory bodies in the nation, Netherlands zeolite 4A industry size is anticipated to garner a massive revenue by 2013, having generated a valuation of USD 35 million in 2015. The existence of a strict regulatory framework is also expected to impel France zeolite 4A market. With Germany, Netherlands, France, and Belgium being the chief contributors, Europe zeolite 4A industry is anticipated to be one of the most lucrative growth avenues by 2024. 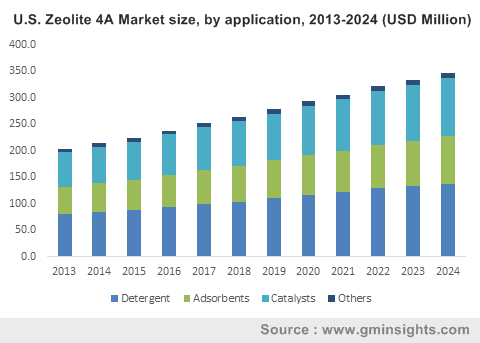 Brazil zeolite 4A market size from detergent applications is also slated to record a business of 10 kilo tons by 2024. Zeolites are used as adsorbents in waste water treatment, chemical, and the oil & gas sectors. Their crystalline structure makes them suitable for adsorption applications, and they are used as effective agents for drying and purifying gases and liquids. Zeolite 4A industry size from adsorbents was worth more than USD 312 million in 2015 and is anticipated to cross USD 535 million by 2024, with a CAGR projection of 3% over 2016-2024. This growth can be credited to the usage of the product across end-use sectors such as oil & gas and chemicals, as well the numerous technological innovations deployed by manufacturers to develop superior adsorbents. India zeolite 4A market size from adsorbents is expected to grow at a rate of 4.5% over 2016-2024, subject to the product’s applications in wastewater treatment plants. Petroleum catalysts have the ability to control catalytic reactions, and are known to offer better product recovery compared to other catalytic reactions, which is anticipated to spur zeolite 4A industry. Zeolite-based catalysts are used in the end-use sectors such as oil & gas and chemicals for fluid cracking and similar catalytic reactions. Refineries across the globe generated an output volume of 76,287 thousand barrels per day in the year 2013 and 76,865 thousand barrels per day in 2015. Subject to the increasing volume of output from refineries, demand for zeolites in the petroleum sector is expected to grow across the regions of Asia Pacific and the Middle East and Africa. Zeolite 4A market size from catalysts will grow at a rate of 3% over 2016-2024, pertaining to the increasing product usage for downstream petrochemical reactions. China zeolite 4A industry from catalysts will also witness a CAGR of 3% over 2016-2024, subject to the product usage in the increasing number of chemical factories in the region. China zeolite 4A market is also anticipated to grow at rate of 3% over the next few years. This growth can be attributed to the increasing infrastructural expenditure for asphalt concrete mixtures and light weight construction material. Global zeolite 4A market share is rather fragmented and involves the participation of many small and medium sized businesses and large-scale corporations. Key players include BASF, PQ Corporation, Tosoh Corporation, and Clariant International. This entry was posted in Polymers and Advanced Materials and tagged Adsorbents, Catalysts, Detergent, molecular sieve, Zeolite, Zeolite 4A, Zeolite 4A Market, Zeolite 4A Market Analysis, Zeolite 4A Market Forecast, Zeolite 4A Market Growth, Zeolite 4A Market Outlook, Zeolite 4A Market PDF, Zeolite 4A Market Price, Zeolite 4A Market Report, Zeolite 4A Market Share, Zeolite 4A Market Size, Zeolite 4A Market Trends.